There are various term insurance plans in India. However, we may always get confused on assessing which is the top and best term insurance plan in India to buy. Insurance is a need. Instead of buying money-back insurance plans, one can buy a good term insurance plan with low premiums and secure their family. Which are the popular term insurance plans in India? What are the top and best term insurance plans in India to be considered. What is a Term Insurance Plan in India? If you are aware of this, you can skip this section. In simple terms, the Term insurance plan is one which provides risk coverage to the nominee in case of death of the policy holder without any maturity amount. Also Read: Should you opt for Religare Joy health insurance for maternity and new born cover? What are the features of Term Insurance Plans? Term insurance plans are designed for risk coverage only. In case of death, the sum assured is paid to the nominee. Entry age of policy holder – 18 to 60 years. LIC e-Term is no doubt a best term insurance plan in India compared to other competitors / private insurance companies. Also Read: Should you buy LIC online e-Term Term Insurance plan? Option to select accidental death benefit where in case of death of policy holder due to an accident, an additional equal sum assured would be paid to the nominee. This feature comes with additional premium. ICICI Term insurance is top term insurance plan available among private insurance companies based on high claim settlement ratio. Entry age of policy holder – 18 to 65 years. Increase life coverage at key milestones. This makes this as unique term insurance plan. There are 4 plan options to receive death benefit. 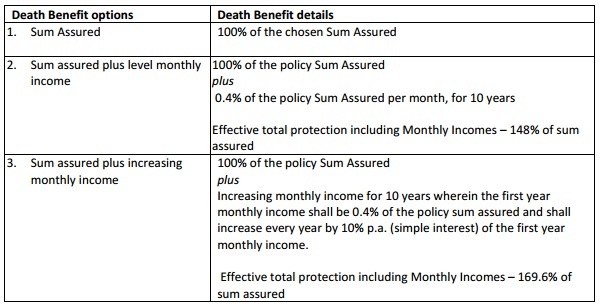 There are 3 plan options to receive death benefit. Get additional cover by way of rider sum assured in case of Death or Dismemberment (impairments are listed under the Rider contract) due to accident. You have the option to add this rider at the time of purchase of the base policy or anytime during the policy term. Max Life Online Term offers lower premium rates for Non-Smokers. There are discounts built in the plan if select higher sum assured. Lower premium rates for female lives. Available in 4 different options. Level Cover, Level Cover with Accidental Death Benefit, Increasing Cover, Increasing Cover with accidental death benefit. Also Read: How claim settlement ratio would influence your decision to buy term insurance plan? Waiver of Basic Premiums on Total & Permanent Disability. Readers, what is your view on some of these top and best term insurance plans in India? hello sir. thanks for the article. it is very informative. sir is claim ratio really important sir? i want to buy indiafirst life term plan because it is very cheap. but claims settlement ratio is verry low for that company. i read in mintwise.com that claim ratio is not fully reliable because of various factors like company age, and type of policies sold by company. then can i ignor e claim ratio and buy indiafirst life term insurance? is it good company, sir?